Naissance : 18 septembre 1932, à Tomsk, Russie, Union soviétique. Total : 23 j. 00 h. 08 min. Retraite : 7 juillet 1987. Décès : 18 octobre 2002 (70 ans). Nikolay Nikolayevich Rukavishnikov was born in Tomsk, Siberia, on September 18, 1932. 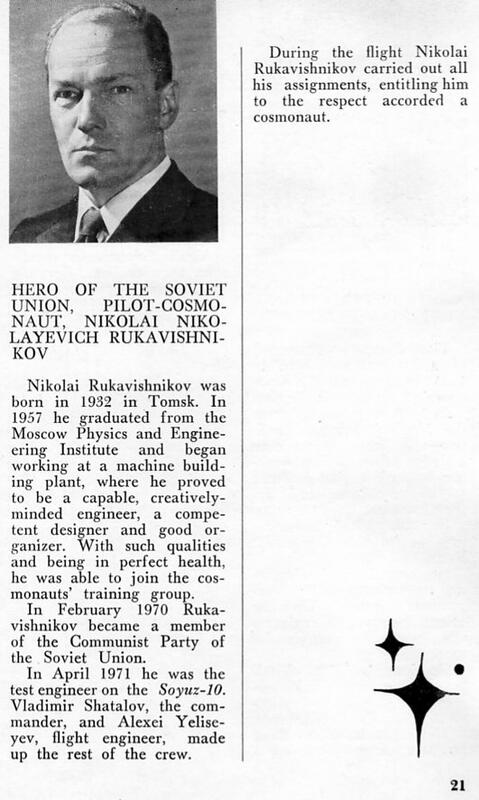 He graduated from the Moscow Engineering and Physics Institute and was immediately swept into the burgeoning Soviet space industry. From 1957 to 1967 he was an engineer with the Korolev OKB, and in 1967 (aged 34) became a cosmonaut. He was a member of one of the two-man teams training for the L-1 (Zond) manned circumlunar mission, until it was cancelled in 1969. He was then to have been on the first Salyut space station crew but a docking problem forced his crew to land early in April 1971. When a second crew succeeded in boarding the station in June, Rukavishnikov was named to the third crew for a flight in August but that mission was cancelled following the death of the second crew on their return to Earth. Following further Salyut failures in 1972 and 1973, Rukavishnikov was named to a crew which performed a shake-down test of the ASTP modifications, in December 1974, on a non-docking 6-day orbital mission. His last chance to visit a space station came in April 1984 when he was on the crew of Soyuz T-11. 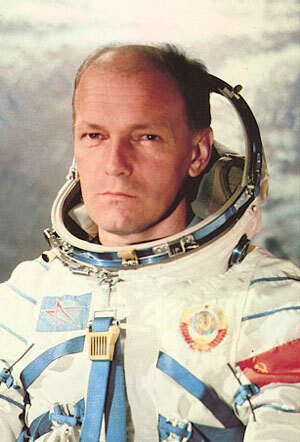 However, he was replaced due to an illness, and resigned from the cosmonaut corps (age 51). 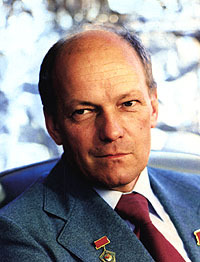 He returned to full-time work at the Korolev team, by now known as NPO-Energia (later RSC-Energia).